As part of the Protected and Served? survey, Lambda Legal asked respondents to share their personal stories of mistreatment by police, in courts, in prisons and by school security toward LGBT and HIV-positive people. See other stories or contribute your own here. Over the past decade, our nation’s school systems have had to respond to challenges including violence and bullying on school campuses, which have resulted in a shift in the approach to school security and discipline. But in far too many cases, the very strategies and systems that were designed to protect students and increase academic performance have served to jeopardize and further marginalize those students who are already at-risk, including LGBTQ (lesbian, gay, bisexual, transgender, queer and questioning) youth. In 2012, Lambda Legal — a national organization committed to achieving full recognition of the civil rights of LGBT people and people living with HIV through impact litigation, education and public policy work — conducted Protected and Served?, a national study exploring the issue of government misconduct by the police, courts, prisons and school security against lesbian, gay, bisexual and transgender (LGBT) people as well as people living with HIV in the United States. (Note that in our findings, one of the categories we use, based on self-definitions, is “transgender or gender-nonconforming [TGNC]”). A total of 2,376 people completed the individual survey. Respondents were also given the opportunity to share their own accounts of their experiences with government misconduct and some of those stories are also incorporated into this report. Lambda Legal’s survey sought to uncover information about the impact of school security and safety officers on LGBTQ students and issues concerning the ways LGBTQ students are disciplined in schools. Survey respondents between the ages of 18-24 were asked about their experiences in middle and high school. This group of 280 represented 13% of all survey respondents and was more diverse than our survey respondents overall in terms of sexual orientation, gender identity, and race and ethnicity. 31% identified as people of color, with 15% multiracial, 12% Latino, 10% African-American, 7% Native American, 5% Asian, and 1% Middle Eastern. 82% identified as at least partly as white (respondents were asked to check all race/ethnicity categories that applied, and this high percentage includes multiracial respondents who listed multiple categories). 22% identified as people of color, meaning they entered one or more of the following: Native American, African-American, Latina/o, Middle Eastern, Asian/Pacific Islander or “other” race/ethnicity. 8% identified as multiracial, 9% identified as Latina/o, 7% identified, as African American, 4% identified as Native American, 3% identified as Asian/Pacific Islander and 1% identified as Middle Eastern. Some identified as white and another race or ethnicity, which is why these numbers exceed 100 percent. Respondents who were 18-24 years old were also diverse in terms of sexual orientation (respondents were asked to check all categories that applied). Among respondents 18-24 years of age, 29% identified as transgender, genderqueer, or other gender-nonconforming identities (indicating that gender-nonconforming identities are more common among younger LGBTQ respondents than among older LGBTQ respondents). Of all respondents, 20% identified at TGNC. (TGNC respondents were permitted to choose more than one option, which explains why the above adds up to more than 100%). more than two-thirds (68%) had school security or school police in their middle and/or high schools. respondents of color were more likely to attend (or to have attended) schools with security or police (79%) than white respondents (63%). Latina/o respondents were the most likely to have security in school (91%). Some of the very security officers appointed to protect students have contributed to a hostile or indifferent climate for LGBTQ students. In addition, nearly two-thirds of all respondents 18-24 (64%) described the attitudes of school security officers toward them as indifferent. Of those respondents who had school security or police at their schools, 23% heard security or police use anti-LGBTQ language, such as “fag” or “dyke,” during school. Respondents of color (31%), particularly Native American (33%) and Latina/o (45%*) and TGNC respondents of color (35%), were much more likely than other students to hear anti-LGBTQ language. LGBTQ students also report being verbally assaulted by school security and police. Nearly 1 in 10 (9%) of respondents who had school security or police in their schools reported being verbally assaulted by school security or school police. 15% of respondents of color and 26% of Latina/o and 15% of TGNC respondents with security and/or police in their schools reported that they were verbally assaulted by those security personnel. It is important to note that these figures reflect self-reports of verbal assault, and definitions of verbal assault may vary among respondents. Verbal assaults may or may not be specifically related to a respondent’s sexual orientation or gender identity. Nevertheless, this data is significant, because security officers are charged with ensuring everyone’s safety, not contributing to a climate that, for a strong majority of LGBTQ youth, is or feels unsafe. Among respondents ages 18-24, 19% felt they were treated harshly by school officials because of their LGBTQ identity. Respondents who were disabled (24%), TGNC (26%), TGNC people of color (39%) or Native American (44%) were even more likely to feel treated harshly because of their sexual orientation, gender identity or gender expression. By way of comparison, while national data are unavailable on school detention, a recent national study by The Civil Rights Project found that 11% of overall middle and high school students were suspended annually, including 24% of black students and 12% of Latinas/os versus 8% of whites. Where security was present, students of color, transgender and gender-nonconforming (TGNC) and other marginalized students were more likely to be searched by security than respondents who had attended guarded or policed schools overall. 21% of all respondents with school security reported that they had been searched or asked to empty their pockets, purses or backpacks. Native American (33%), Latina/o (33%) and African American (25%) respondents were searched at higher rates. So were TGNC (28%) and disabled (30%) respondents. limit interventions that push students out of school — such as expulsions, disciplinary transfers, out-of-school suspensions, referrals to law enforcement, and school-based arrests — to conduct that poses a serious safety threat to students and staff. refrain from imposing discipline as a means of gender policing. Schools should not interfere with equal access to restrooms, or with students dressing according to their gender identity. create enumerated anti-bullying policies that specifically include sexual orientation and gender identity and expression and make these policies easily accessible in student handbooks and online. implement comprehensive curricula supporting diversity and respect for all. train administrators, educators, school safety officers and other staff to address anti-LGBTQ bullying and harassment. Trainings should include information about how to interrupt and to report bullying and harassment by students, staff, security and school security personnel. support LGBTQ-affirming clubs like gay-straight alliances, and promote safe spaces for LGBTQ youth in schools. consider alternative programs when appropriate, including peer mediation, conflict resolution, guidance counseling, peer juries and courts, mentoring, character education, and parental and community involvement initiatives. These options can be helpful, but are not suitable for all situations — for example, targets of bullying or harassment should not be asked to “mediate” their situations with alleged perpetrators. at the district level, ensure that control and accountability for school security remains with the school or school district so teachers and administrators can interrupt and report harassment and bullying by security. Privatizing school security and/or relying on police departments to administer school safety measures can lead to increased criminalization of students and less accountability. at the district level, comply with or create a public reporting system for school discipline data including expulsions, in- and out-of-school suspensions, school-based arrests, and referrals to law enforcement, with data disaggregated by reason for discipline, age, grade, gender, gender identity, race/ethnicity, sexual orientation, disability and school. include employment policies that can help improve the hiring and retention of LGBT employees as well as contribute to a more LGBT-friendly environment. “School Push Out” or “School-to-Prison Pipeline” refers to policies and practices that, instead of helping to provide students with a quality education, criminalize students and push them out of schools and into the criminal justice system as well as the low-wage workforce and the streets. Interrelated factors that have been shown to contribute to this push out include severe disciplinary policies like “zero tolerance,” the use of security and law enforcement to police schools and an unsafe and hostile environment for many students. The 1980s marked the beginning of increasingly punitive law enforcement and public education policies. As law enforcement strategies such as mandatory sentencing and three strikes laws became more of the norm and these policies increasingly targeted youth, schools began implementing similar polices as a way to address student behavior problems. “Zero tolerance” policies in schools impose a rigid protocol of punishment for infractions. 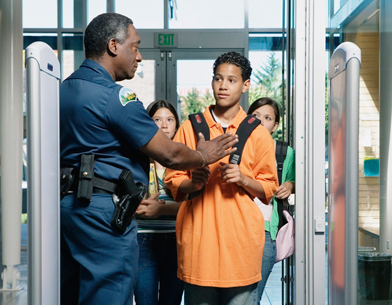 While zero tolerance began as an effort to reduce the presence of weapons, local school districts have broadened the scope of these policies to be employed at all grade levels (including in elementary and preschool) and to include a variety of behaviors from drug and alcohol possession, acts of violence and bullying to minor offenses such as chewing gum, carrying cell phones or vague infractions such as “disruptiveness” or “defiance.” One-time offenses often result in immediate detention, suspension or even expulsion, leaving no flexibility for teachers and administrators to resolve minor incidents. Research by The Civil Rights Project that analyzes state databases containing the reasons students are suspended demonstrates that most out-of-school suspensions are for minor offenses. Besides the obvious lack of time in the classroom, suspensions are problematic because they are a leading indicator of whether a child will drop out of school and out-of-school suspension increases a student’s risk for future incarceration. The 1999 school massacre in Columbine, Colorado and numerous other incidents of school violence have sparked a drastic increase in the use of security measures in schools including metal detectors, security cameras and security or safety officers. Advocates such as the ACLU point out that the greater emphasis placed on using test scores as a way to evaluate and impose sanctions on teachers and schools and determine both school funding and high school graduation contributes to school push out. This “high-stakes testing” which was supposed to improve academic performance and close achievement gaps instead forces educators to deemphasize subjects that are not on tests, damages school climate, reduces students’ engagement and can lead to an increase in the level of discipline handed out to lower-performing students as a way to push those them out of schools and increase overall test scores. In Florida, for example, a researcher at the University of Florida found schools gave low-scoring students longer suspensions than high scoring students who committed similar infractions. The National Research Council (NRC) found that graduation tests increase the dropout rate without improving learning or college or job readiness. Bias and harassment within a school can also alienate and ostracize students. Students targeted for harassment are isolated or sent to inappropriate alternative schools, driven from their school placements rather than protected. Students of color, LGBTQ students, foster children and those with learning disabilities can be subject to subtle and overt—acts of discrimination. LGBTQ students may be directly targeted and singled out by teachers, administrators and security because of their sexual orientation, gender identity and gender expression. In an environment where students are expected to conform to mainstream gender roles, LGBTQ students can be perceived as defiant or troublemakers simply because they choose to openly express who they are. According to a national GLSEN study, “some [LGBTQ ] students…reported that they had received detention or suspension for PDA [public displays of affection] when their non-LGBT counterparts had not been punished or had received much milder punishments.” School environments can be especially punitive for transgender and gender non-conforming students who often are disciplined for being who they are-- for example, gender non-conforming students may be targeted for dress code violations or transgender students might be singled out by not being allowed to use the correct bathroom. Without appropriate official leadership and intervention to address school environments, some students avoid school in attempts to keep themselves safe. They may become truant, lose educational opportunities, and are more likely to be found on the street and in encounters with law enforcement that result in juvenile and criminal records.